Former Charlton director Peter Varney has confirmed he attempted to meet current owner Roland Duchatelet about investment in the Championship club. Addicks supporters have staged protests against Duchatelet, but the Belgian remains committed to running the club. Varney, now working at non-league Ebbsfleet United, was acting on behalf of a third-party investor. "It is well documented fans aren't very happy with the ownership model and I was trying to help," said Varney. "It has become clear in recent times that Charlton isn't for sale and they are carrying on with the model they have got there. That is their right to do that. "I think it is a shame because the deal would have been good for the owners if they had listened to the proposition, and it would have been good for Charlton." Emails published in Charlton fanzine the Voice of the Valley documented Varney's attempts to obtain a meeting with Duchatelet or Charlton chief executive Katrien Meire about the investment. "I was approached back in August by a potential investor who was interested in a London club," Varney told BBC Radio Kent. 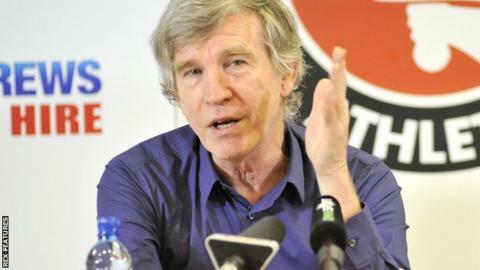 "Having been involved with Charlton as a supporter and working there for 14 years, I made an approach to the owners. "I said 'This person has great credibility and would you like to meet them?' but I never got a response, apart from an attempt to have meetings that were cancelled at short notice." "It was not an attempt to go back - it was an attempt to help a situation in a club I have a deep feeling for. We have a massive project here at Ebbsfleet and I am not going back."